“I was born next to a rail crossing, fascinated by the fast passing of the night trains which, like bright comets, whistled their long and far escape. I’ve loved vinyl since the years it seemed destined to disappear and still today I have a collection of over 1500 records steadily increasing. I love all kind of music, I like to close my eyes and spend time in listening it. Luca Mauceri, born in 1975, actor and musician, graduated in Rome with honors in Performing Arts at La Sapienza University. His theatrical training sees national and international masters such as Ferruccio di Cori, Gary Brackett of the Living Theater, the French mime Yves Lebreton, Claudio De Maglio, Margarete Assmut. From 2000 to 2001 he studied at the Potlach Theater center in Fara Sabina, taking part in several intensive stages for the body and voice conducted by Daniela Regnoli. In September 2002 he was selected at the Piccolo Teatro in Milan as an actor for the show M’illumino di tragico, directed by G. Ceronetti. 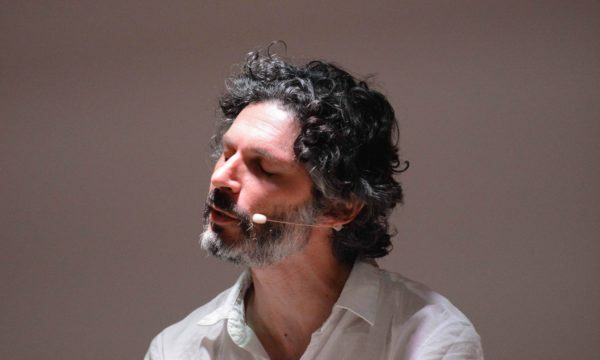 Since January 2003 he has worked steadily with the Teatro dei Sensibili of G. Ceronetti with whom he has prepared over ten performances produced by important national realities such as the Piccolo teatro di Milano / Teatro d’Europa. In December 2002 he took part in several intensive stages with Luca Ronconi, Peter Brook, Stefano de Luca, Gilberto Tofano and Franco Graziosi, at the Teatro Strehler in Milan. From 2004 to 2006 he acted with the Compagnia di Rivista Marco Leandris. Since February 2006 he has worked with the Sicilian director V. Pirrotta, with whom he collaborates as an actor, musician and composer in the shows La sagra del signore della nave (The Lord of the Ship), produced by the Teatro di Roma, ‘U Ciclopu (The cyclope) for the Teatro Stabile di Catania,’ N’gnanzou, La fuga di Enea (The escape of Aeneas), Malaluna, Lunaria, L’ultimo giorno di un condannato a morte (The last day of a condemned to death) produced by Esperidio. In March 2008 actor and musician in the show Don Giovanni directed by F. Banfo, produced by Compagnia della Corte di Pavia. In March 2009 actor, musician and composer in the show I misteri di Londra directed by M. Tamietti, Teatro Stabile di Torino – Teatro ODS. In November 2009 actor and composer along with Luigi Lo Cascio in the show Diceria dell’untore, for the production of the Teatro Stabile di Catania. Since March 2010 he has been working with Loescher publishing house in Turin recording audio books for the secondary schools. In June 2011 he composed and orchestrated the music for the show Quei ragazzi di Regalpetra (produced by Teatro Stabile di Catania) performed by the Orchestra of the Bellini Music Institute of Catania conducted by Maestro Giuseppe Romeo. In June 2012 hactor in the new co-production of Piccolo Teatro di Milano/Teatro dei Sensibili Pesciolini fuor d’acqua directed by G. Ceronetti. 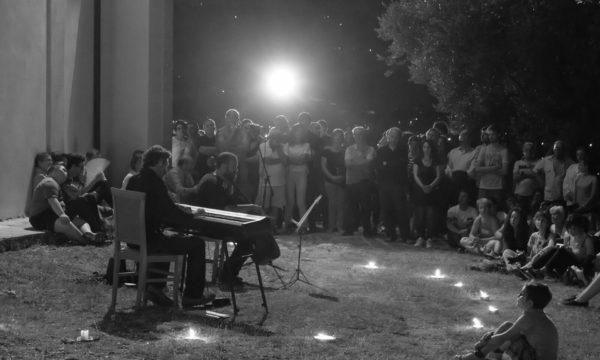 From June to August 2012 he is artistic director of the summer cultural festival of the Stromboli EOS Theater. In May 2013 composer for the show Donnein parlamento (Women at the Parliament) of Aristophanes at the Greek Theater of Syracuse starring Anna Bonaiuto. In April 2015 he is the main character of the show Jacopino Vespignani directed by G. Cauteruccio, produced by Teatro Studio Krypton. In August 2015 he took part in the TV series L’ispettore Coliandro produced by RAI, directed by the Manetti brothers. In March 2016 he plays the main character in the show U principuzzu nicu (The little prince), directed by G. Calcagno, produced by La Casa dei Santi of Milan. The show becomes also an audiobook produced by EMA Vinci Records with the music of Luca Mauceri. From 2016 he works with the Sicilian company BANNED THEATER directed by Ferrante / De Grandi. In December 2017 he composed the music for The modernist, a commercial videoclip of fashion and clothing, directed by G. de Angelis.